OTTAWA-If Jonas the abducted tiger isn’t found soon he may die from dehydration as early as this morning says a veterinarian who has raised the animal from a cub. 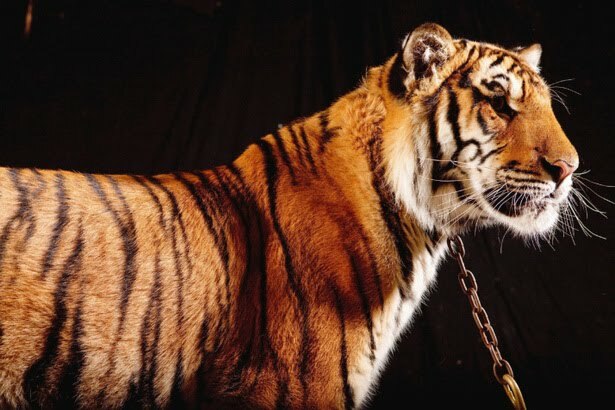 A distraught Wendy Korver, veterinarian for the Bowmanville Zoo, made that grim assessment as the abducted three-year-old tiger’s whereabouts remained a mystery late Sunday. Jonas, along with two camels, Sean and Todd, were inadvertently abducted Friday morning in central Quebec when thieves made off with a pickup truck and trailer as the trio of animals were being brought back from the Maritimes to the zoo in Bowmanville. The pickup truck was found early Saturday morning in St-Eulalie, 73 kilometres from the scene of the theft in the town of St-Liboire. Police think the thieves were after the aluminum trailer, which can fetch a high price as recycled aluminum. “You have to admit at this stage of the game you start to feel pretty hopeless,” said Korver. The zoo has announced a $20,000 reward for information leading to the safe return of the animals as well as a $2,000 reward for a photo of the animals being given water. Michael Hackenberger, director of the Bowmanville Zoo, said anyone with information may call the zoo directly at 1-905-926-5605 and he has pledged that they will not be charged. A photo of the animals may be uploaded via the zoo’s website. The Bowmanville Zoo is one of the largest suppliers of trained animals for the feature film and television industry. Hackenberger has issued a plea that the thieves provide water and shade for the animals. He said the camels, which are in stalls on the trailer, can be given buckets of water, while the tiger can be given water by extending a water-filled turkey baster through the cage. Police are looking for an aluminum EBY brand trailer, which resembles the kind used to haul livestock, with an Ontario licence plate number of E4398Y. Hackenberger asks that if anyone spots the trailer parked somewhere they try to open any windows that are closed and contact police. While police in Quebec and Ontario are on the lookout, the Sûreté du Québec has tasked 40 officers and a search helicopter with finding the animals.